ZTE Axon is the latest sub-brand of the company after the recent Blade and Nubia lines. Check out the international version off the ZTE Axon! ZTE Nubia line of smartphones is an instant success. The series comes with a refined hardware and performance-based spec sheet which made the line one of the most loved sub-brands from the Chinese manufacturer. Last July, ZTE released the first ever Axon handset which is basically intended for the US market; while the international version of the handset was just rolled out recently. So, what makes this device stand-out in the fiercely contested market? Stay with us as we talk about the ZTE Axon right after the fold. For one, the device comes with a promising specs sheet. The metal-clad smartphone has a generous 5.5-inch display with full HD resolution, that's doubling the typical 720p count of HD panels. To be specific, the ZTE Axon's full HD screen packs 1920 x 1080 pixels while the module is made up of a TFT LCD panel from Sharp. The ZTE Axon gives a good competition to other Android handsets in terms of internals too. In fact, it harnesses its computing power from the Snapdragon 810 which is identical to the HTC One M9 and the OnePlus 2. The SoC has an octa-core processor that is made up of 2GHz quad-core and 1.5 GHz quad-core CPU. In terms of graphics, the chipset packs the Adreno 430 GPU which is quite a worker in rendering graphics. There's also a significant inclusion of 3GB of RAM and 32GB internal memory. On the software front, the handset comes with an older version of Lollipop - Android 5.0.2. ZTE makes it to a point that it only includes minimal bloatware in the handset which is quite a great idea. This top of the line metal-built handset also possesses remarkable abilities in capturing photos. It actually has a dual-lens arrangement at the back of the phone. This helps in refocusing images after you press the shutter button. It is also capable of Bokeh effects or blurring of background. There's the main 13-megapixel sensor and a smaller 2-megapixel accomplice; the set-up is similar to HTC One M8's module. The front-facing camera is an 8-megapixel affair with 88-degree wide angle lens. The handset also comes with Voice Recognition and Fingerprint sensor. In terms of battery, the ZTE Axon offers 3000 mAh of juice to support all the powerful hardware housed inside its shell. The handset also comes with a Hi-Fi audio playback of 32-bit 192 KHz audio samples and an LTE connectivity. 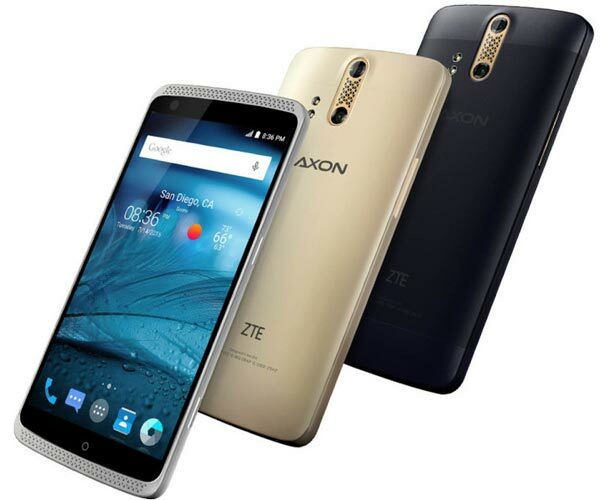 You can get the ZTE Axon in Ion Gold, Chromium Silver and Blue. It is currently sold in the United States, but those who wanted to get an earlier grip on the international version can check it in GearBest.